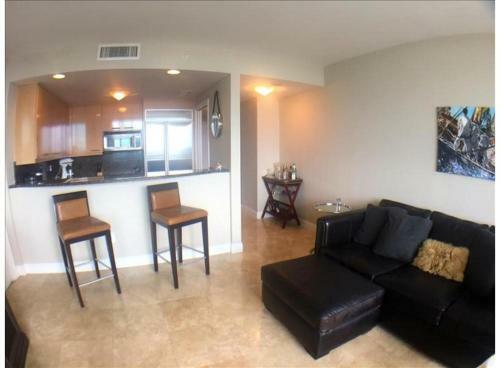 Situated 1 km from Cocowalk Shopping Center in Miami, this air-conditioned apartment features a balcony with sea views. The apartment is 3 km from Miracle Mile Miami. The kitchen comes with a dishwasher, an oven and a microwave, as well as a coffee machine. A flat-screen TV and DVD player are offered. Other facilities at Ritz-Carlton Coconut Grove include a sauna and outdoor pool. Vizcaya Museum is 3.1 km from Ritz-Carlton Coconut Grove, while Miami Museum of Science and Planetarium is 3.2 km away. Miami International Airport is 8 km from the property. Guests are required to show a photo identification and credit card upon check-in. Please note that all Special Requests are subject to availability and additional charges may apply.Please inform Ritz-Carlton Coconut Grove in advance of your expected arrival time. You can use the Special Requests box when booking, or contact the property directly with the contact details provided in your confirmation.Guests must be 25 years of age or older to check-in and must be staying at the property. Please note if the reservation is cancelled, the total amount plus all fees (including the service charge and taxes) are non-refundable.